It isn’t too often that I get to visit all the amazing things that await me North of 635. What can I say, there are just so many fabulous spots in the Downtown area that it is hard to visit every single one. I definitely eat more meals than the average person but come on people, as much as I wish my full-time job was entitled “professional eater,” I do have a life! 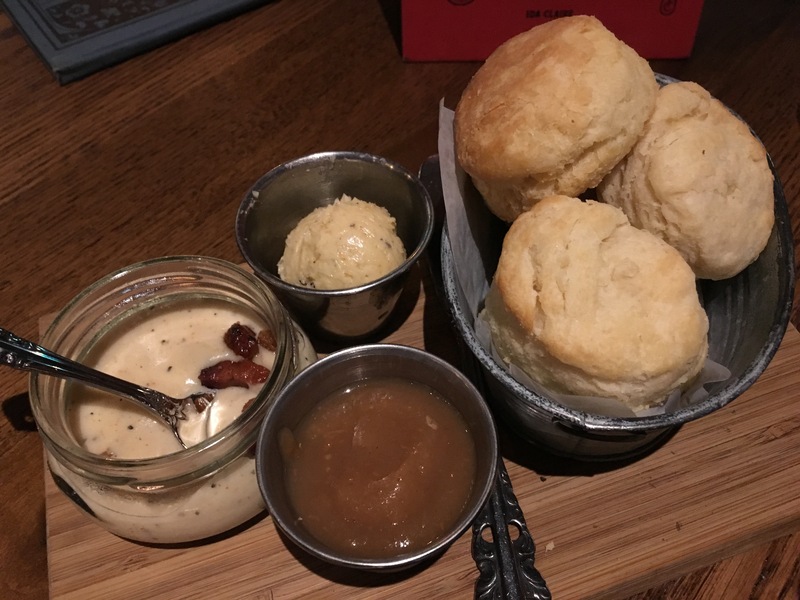 On a recent trip “up North” I had the opportunity to try out Ida Claire, a Southern-inspired dining destination in the heart of Addison off Belt Line Road. When I walked in, it was love at first sight. Adorable antique plates line the bar area, an airstream trailer doubles as a table out in the garden and there are kitschy decorations everywhere you look. After we were seated, a super-friendly waiter stopped by to tell us a little bit more about Ida Claire (get it? Ida Claire = I Declare!) and everything it had to offer. Now, I had already seriously stalked the menu so I knew all of the things I wanted to try and I sure didn’t hold back. Our table started with Crawfish Corn Fritters, Fried Green Tomatoes, and Ida’s Biscuits. Aggressive? Maybe…but it all sounded just too damn good to not try. The Crawfish Corn Fritters come out piping hot and perfectly fried. They are decently sized for just $8 and as much as you will be wishing you had another order, you definitely get your money worth. The Crawfish Corn Fritters are basically hush-puppies stuffed with fresh pieces of crawfish so seriously, why wouldn’t you get another order? I could easily put down a dozen on my own. The Fried Green Tomatoes were quite possibly the best I have ever had. Now, folks, that is saying a lot because I have had my fair share of FGT’s in my lifetime and one my earliest memories is my Grandmother frying them up in the kitchen so to say these are my favorite is some serious business. 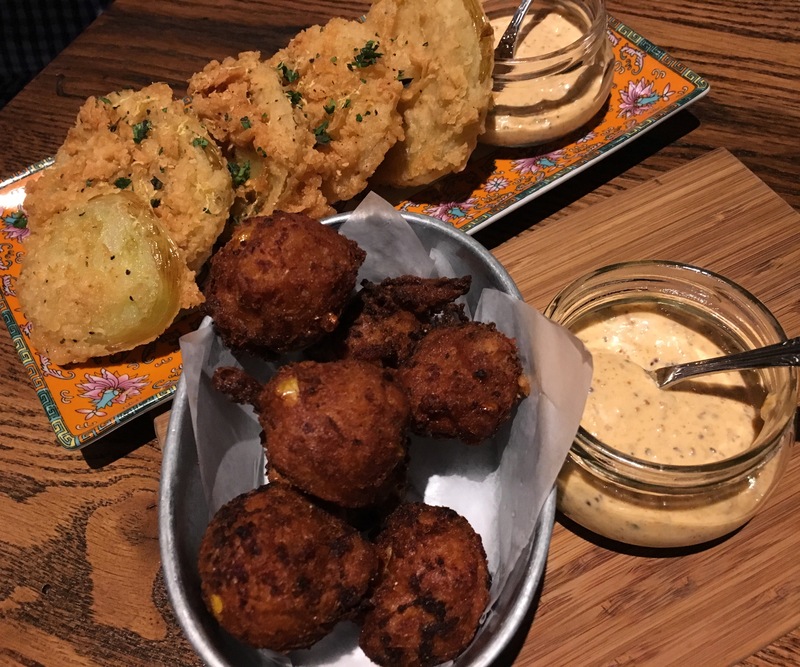 Both of these appetizers are served with Ida Claire’s Smoked Mustard Remoulade that is so good they need to jar it up and sell it immediately…and give me 10% for the brilliant idea! Continuing with the carb-loading, out came Ida’s Biscuits. Served with savory butter, bacon gravy and house jam that rotates often (during our visit, the house jam was pear!) these biscuits are what Southern dreams are made of. Light and fluffy but dense enough to feel substantial, it was clear that good ol’ Ida knows what she’s doing! Do yourself a solid and grab an order of these to go with your entrée leftovers. Just sayin’. Now, trying to decide what to have for our entrées from Ida Claire’s Southern classics wasn’t an easy job but alas we decided to go with the Shrimp & Grits and Chicken & Waffles. I mean, let’s face it. How could we go wrong with those choices, right? RIGHT! 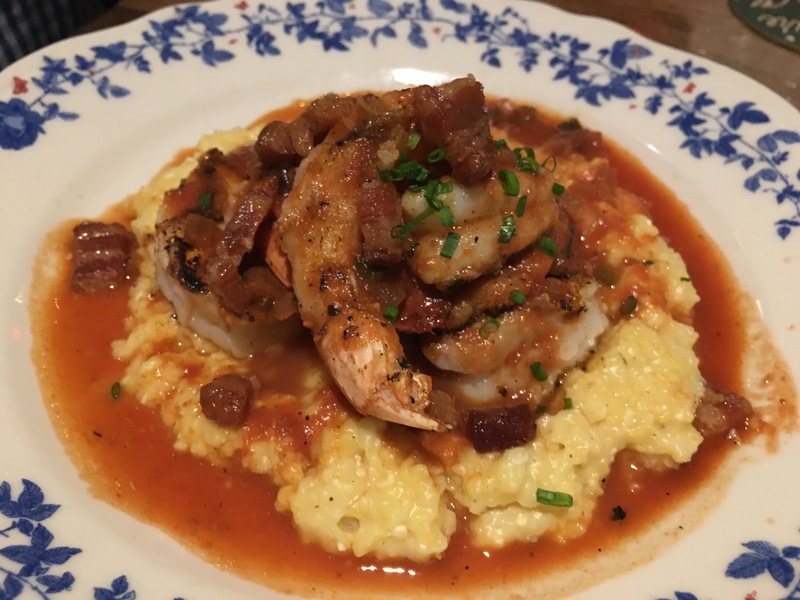 The Shrimp & Grits are Texas prawns with lardons, parmesan grits and piquant sauce. The dish was extremely flavorful with just the right about of smokiness and spice. 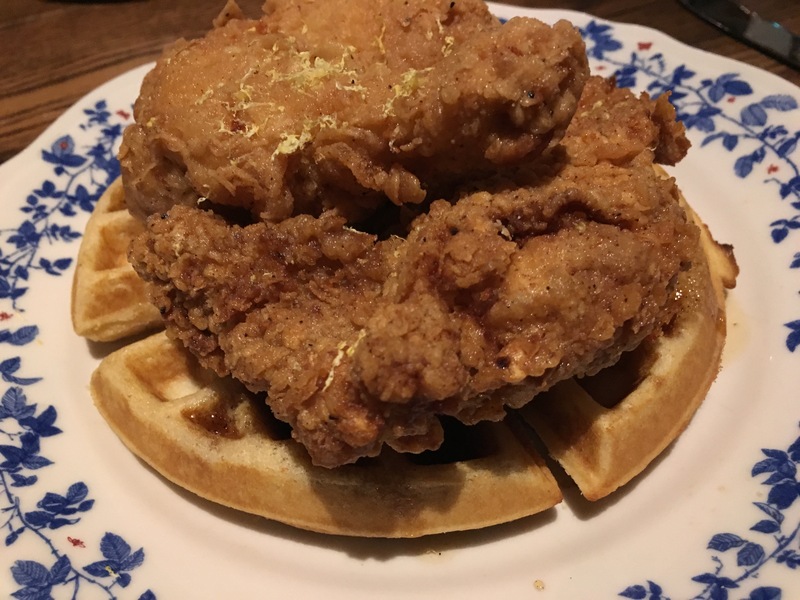 As for the Chicken & Waffles…HELLO, LOVER! A super crispy half chicken with cornmeal waffle served chicory coffee maple syrup and hot sauce butter will have me driving up to Addison every.damn.day. HOT SAUCE BUTTER, people. Like, omg. So simple and so genius! 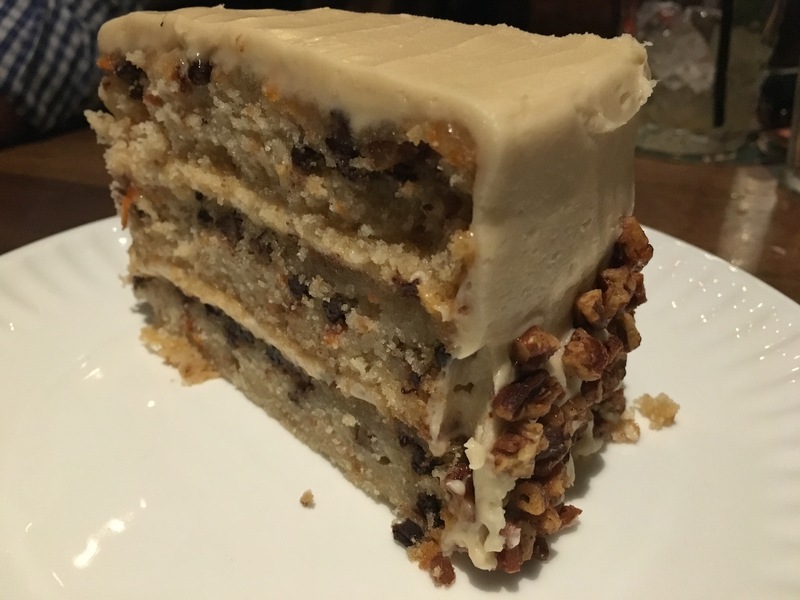 As if we really needed dessert we topped off the evening with Ida Claire’s Bartender’s Cake. I don’t know what the hell makes this cake bartener-y, do you have to be drunk to order it? Did someone black out drunk invent it? When it looks and tastes like this, who really cares? Seven butter cake with spiced pecans and brown sugar cream cheese frosting allow for a cavity-inducing experience and I loved every damn minute. Even if you don’t have room after your meal, ORDER IT. As much as I appreciate you all reading my little write-up of Ida Claire, I do realize that it isn’t enough to explain just how amazing this new restaurant is. It is truly a gem and I highly suggest you add a visit (or 12) to your calendar immediately. After all…I may beat you there and eat all of their food!